Concrete outperforms wood as a construction material, and won’t burden building owners with constant repair and maintenance costs. Versatile, long-lasting and durable, concrete is a cost-effective, sustainable choice for both residential and commercial buildings. When it’s built with concrete, it’s built to last. Concrete is a building material that gains strength over time. Concrete’s 100-year service life conserves resources by reducing the need for reconstruction. Concrete is durable – it resists weathering, erosion and natural disasters, needs few repairs and little maintenance, adding up to a solid investment. Operational energy requirements typically represent 85% of the total energy a building uses over its service life. Concrete provides one of the most efficient and cost-effective means of constructing energy-efficient structures. A sustainable concrete building can yield life cycle savings of more than 20% of total construction cost. Much of the savings come from concrete’s thermal mass, which can harvest natural energy sources such as the sun, and can also capture thermal energy from lighting fixtures and other equipment in the building. When combined with active radiant heating and cooling systems, the thermal mass of a concrete structure can reduce heating and cooling energy requirements by 29% and more. The Cobalt Engineering Report shows heavy frame buildings (concrete) generate average energy savings of 20% to 25% over light frame buildings (wood) in various locations across Canada. The Stantec Consultants Report compares annual energy use in a building constructed in the 1960s with one built using modern energy-efficient thermal mass concepts. A monitored study of such a concrete building at the University of British Columbia demonstrated a 59% energy saving over older designs of similarly occupied buildings that didn’t integrate active energy systems with the thermal mass effect. Concrete is safe, secure and healthy for building occupants. Being an inert construction material, concrete does not burn. It also does not feed rot and mildew. It does not off-gas any volatile organic compounds and provides excellent indoor air quality. Superior quality of construction helps prevent the entry of pollen, dust and other airborne pollutants. Concrete is a known quantity to designers, engineers and builders. Construction techniques have been refined over time and are well understood , unlike new materials or systems which could compromise health and safety. The structural integrity of concrete provides added protection against earthquakes and severe weather. Thanks to solid construction and the benefits of thermal mass, concrete provides superior protection against the effects of outdoor temperature swings, which means a draft-free interior environment and consistent room temperatures, year-round. A peaceful and quiet building enhances the comfort of occupants and provides a sense of privacy – solid walls and floors make all the difference. Environmentally-conscious builders look for durable building materials that leave the smallest environmental footprint. Produced from locally available, abundant materials, concrete’s long lifespan helps make it the most responsible choice for a sustainable future. In concrete’s life cycle, recycling is present from start to finish. Many wastes and industrial byproducts that would end up in landfills are used in the cement kiln or can be added to concrete mixes to provide desirable characteristics. Used concrete is recyclable and serves as aggregate in roadbeds or as granular material in new concrete. While production of a cubic metre of conventional concrete generates 210 kilograms of CO2, this effect is mitigated by the inclusion of supplementary cementing materials, and by the use of waste products to heat the cement kilns. In addition, continuing research and development is further reducing concrete’s carbon footprint. The 2010 National Building Code of Canada will reference the cement and concrete standards containing Portland-limestone cement (PLC). Manufacturing PLC reduces CO2 emissions by up to 10% compared to conventional Portland cement, and the resulting concrete has the same strength and durability. Other recent developments include new photo-catalytic cements, which make concrete that binds airborne nitrogen and sulfur oxides into insoluble salts, thereby reducing urban smog. The same properties also significantly reduce the amount of cleaning needed on the exterior of buildings. Concrete buildings help governments and developers meet sustainability goals. They reduce the urban heat island effect, and easily support “green roof” projects. 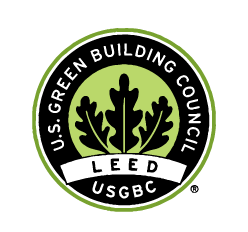 The Leadership in Energy and Environmental Design (LEED) Green Building Rating System™ provides standards for what constitutes a “green building.” It aims to rate the energy and environmental performance of a building and encourages market evolution toward sustainable design and construction.